Depending on a variety of things, the wet T-shirt method can cool a 5-gallon (19-L) volume of beer between 5 and 10 °F (~3–5 °C). The main variables here are humidity, airflow and surface area. Air conditioning takes moisture out of the air as it cools, so the wet T-shirt method works well in air conditioned spaces. 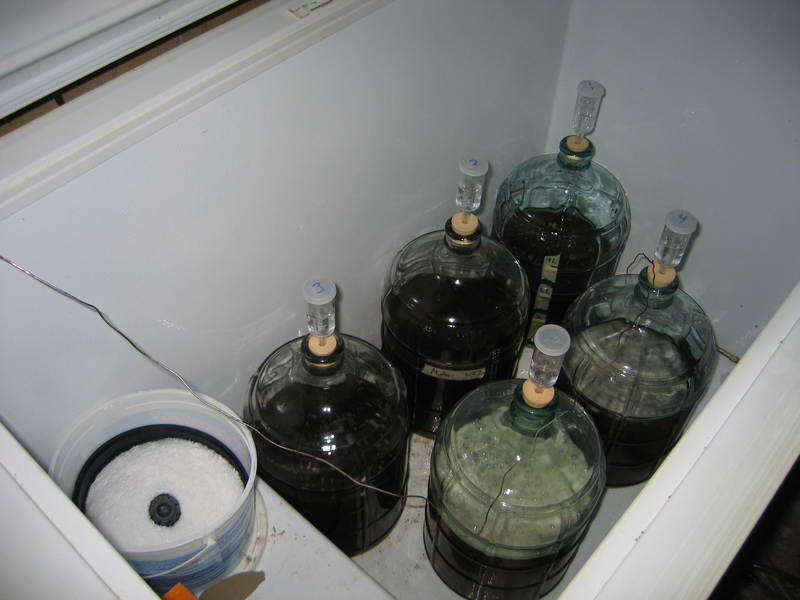 If you keep your carboy somewhere humid, the method will work less well. If you place a fan to blow across the carboy, you will move humid air away and increase the effectiveness of the cooling. You only need a slight breeze for this. I sometimes put my carboys under a ceiling fan on low, and that works fine. Experience has taught me to change the T-shirt every couple days. If not, it will begin to get moldy, and you don’t want mold growing near your beer. If you use old T-shirts that are not destined to be worn again (and I recommend this), you can add a small amount of bleach or Star San to the water reservoir to retard the growth of microorganisms. Every four or five days, change the water. Another consideration is lifting the carboy out of the water. Wet glass is very slick. If you have a carboy hauler, use this to lift the carboy out of the water. If not, be careful when lifting. I usually take the T-shirt off the carboy, then lift it out and straight onto a dry towel. I dry the glass (and my hands) thoroughly before lifting it to where it will sit when I rack to keg or secondary. It’s worth your time to dip a paper towel or washcloth in a dilute bleach solution or working strength Star San solution and wipe off the carboy before taking off the airlock. It’s been sitting in a damp environment and could harbor all sorts of bacteria or wild yeasts. If your overnight temperature is going to dip significantly, you can roll the T-shirt up the sides of the carboy and then roll it back down into the water when you wake up the next day. Finally, if possible, use a carboy without a stick-on strip thermometer or cover the thermometer with clear packing tape as the water will foul it in a matter of days. As low-tech as it seems, the wet T-shirt method can be a reliable method of keeping your fermentation temperatures in check. How well does this method work with a bucket fermenter? Does glass make a difference? It should work with a bucket, but I’ve never tried it. You’ll probably need to use clothes pins or binder clips (or something) to hold the T-shirt to the side of the bucket, but it should work. All three items seem like reasonable ways to avoid mold, contamination, etc.